A uniquely green principal named Mr. Bundy runs PS 88 in this funny fairy tale take-off that launches Aladdin QUIX, a new line of fun-to-read short chapter books that are perfect for emerging readers! When Marty Q. Marvel the magician accidentally turns Mr. Bundy into a frog, the students of PS 88 don’t know what to do. 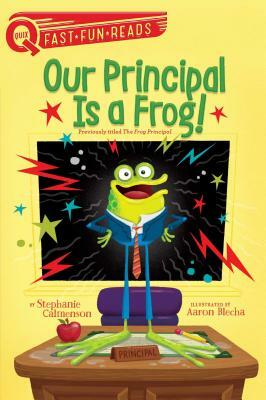 It’s not always easy having a slimy, green-skinned amphibian for a principal, especially when Mr. Bundy starts playing leapfrog in the gym, swimming in the kindergarten sink, and eating the students’ bug collections! Will Mr. Bundy ever be his old self again? Stephanie Calmenson is the acclaimed author of many popular books for young readers including Dinner at the Panda Palace; May I Pet Your Dog? ; and the Ready, Set, Dogs! series written with Magic School Bus author Joanna Cole. A former early childhood teacher and children’s book editor, Stephanie feels fortunate to be able to teach, entertain, and encourage kids through her books. To read more, please visit StephanieCalmenson.com. Aaron Blecha is an artist and author who designs funny characters and illustrates humorous books. His work includes the Shark School series and Goodnight, Grizzle Grump! Originally from Wisconsin, Aaron now lives with his family by the south English seaside.